Dandong (China) (AFP) – Rows of sewing machines in one Chinese garment factory on the border with North Korea are now silent, unmanned after UN sanctions sent home their seamstresses from the secretive country. Factory owners, merchants and shop owners in the border city of Dandong — China’s main trading hub with neighbouring North Korea — are feeling the pinch from the United Nations resolutions. Dandong bet its economy on trade with the North, seeing the benefits of economic growth and rapacious consumption of Chinese products across the border. Envisioning a bright future, the city expanded, building the Dandong New District as a cooperation zone on the banks of the Yalu River, which marks the border. A massive four-lane, $350-million bridge with a new customs area was built to link the zone to the North. Construction of the bridge finished three years ago yet it has not opened. On the North Korean side, concrete runs into fields of snow as Pyongyang has not built roads to meet the bridge. Now UN sanctions — which Beijing has backed as it grows tired of its Cold War-era ally’s nuclear and missile tests — are buffeting Dandong’s economy, which slowed in 2016. In October last year, its port missed a bond payment. “For Dandong’s economy, and the livelihood of the average person in the city, there is an impact,” said Lu Chao, director of the Border Studies Institute at the Liaoning Academy of Social Sciences. The potential of the new bridge and cheap North Korean labour brought Lin and his garment factory to a Dandong factory zone where signs admonishing workers not to smoke or litter are in both Chinese and Korean. “The North Koreans are disciplined and hard working,” Lin said of the 100 North Korean women — “all 18 to 32 years old” — he recruited. He asked his full name not be used. Last year, Lin negotiated a contract with a Dandong labour outsourcer and a North Korean company. On September 1, the women arrived, led by a North Korean manager. The contract covered all the details — a clean dorm for the workers, hot showers three times a week, and time twice a week to “study the policies and worship” the leader Kim Jong-un. “They look at their leader like he’s a god,” Lin said, noting the salaries were to be paid directly to the North Korean manager. As he spoke to AFP on his office sofa sipping tea, he rattled off the UN resolution numbers that have crippled his once thriving garment business. UN Resolution 2371 turned Lin’s plans upside down — his workers arrived two days after China announced its implementation: no new contracts with North Korea. 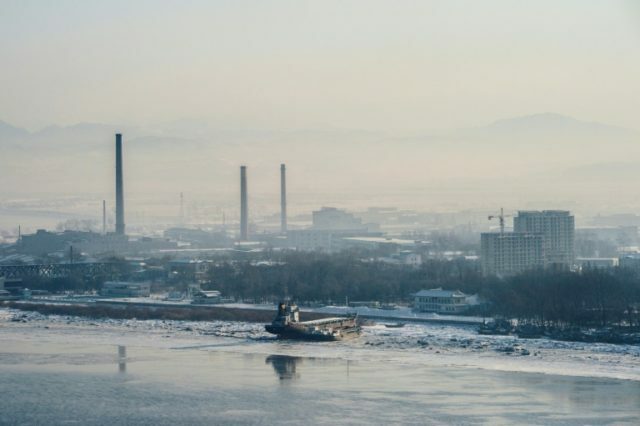 For the past 10 years, Lin hauled material and cloth to factories across the river in Sinuiju and Pyongyang, where North Korean workers turned it into exportable jackets, coats, and other clothing. As new sanctions came down, he saw the writing on the wall and began planning. Today, Lin’s three-floor garment factory is mostly empty. There are no able and cheap Chinese workers in the city, he said. Garment imports from the North have also been sanctioned. There were 30,000 North Koreans working in Dandong before the August sanctions but nearly 6,000 have gone home, he said. Many of the apartments, shopfronts and restaurant spaces in Dandong’s New District are empty. “There’s nothing over here,” said Yue Yue, a real estate agent at the New District’s Singapore City development, where only one-third of the apartments have been sold. “We’ve dropped the prices a bit for the apartments further from the river,” she admitted, noting they had been lowered more than 30 percent. Lu of the Border Institute says that is not likely with the current sanctions regime in place. North Korean-run businesses in the city have begun to close, with several restaurants forced to shut their doors. Truck and train traffic on the older, narrow one-lane Sino-Korean Friendship Bridge that carries most of the trade is said to be down. Roughly 90 percent of the North’s past exports have been sanctioned and new measures now target goods travelling in the other direction. Wang Xueliang, who runs the Dandong Balance Trade Company, said he is no longer allowed to send tractors, trucks and cars to the North. Before he could sell one or two vehicles a month to North Korean clients who paid in yuan or dollars. China cut off all vehicle sales to the North in early January, he said.